Note: Just this once, I’m trying a different way of reviewing. This may get a bit personal, but I hope you’ll ride it out with me — I just really need to try this out. :) A short, yet proper review will be at the end of the post. I’m not sure when you’ll read this again, or if you’ll even be able to ever read this again in a few years or decades from now. I don’t know if this blog will still exist, or if this entry will exist because you can always delete and re-write this sometime in the future. But let’s assume that you won’t do any of the two things I said above and you will eventually read this again, with a surprised smile on your face. 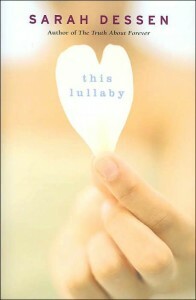 Your brother got married exactly a week ago, and that was the very reason why you picked up This Lullaby by Sarah Dessen once again. This was a so-so book during your first read, probably because you read it during the New Year and you weren’t really feeling the characters nor the situation back then. If you need a reminder on why you picked this up, it’s because all the mushiness in the wedding put you in the mood to read something that had a little of romance in it, and not the paranormal kind. You are not like Remy. You are not like her at all. Okay, maybe in some ways you are, particularly in the way you are both so obsessive-compulsive with everything (but she is more OC than you are)…but in other aspects, you are not. Let’s state the most obvious: Remy is a dating machine. You are definitely not. I think that’s one of the reasons why you didn’t relate to her when you first read it. You can’t understand how someone can do what Remy does: date a guy for a while, be sweet and all, sleep with him and then when the relationship heads for some semblance of seriousness, break it off. I don’t really understand it either, but I know we know some people who are like that. And I know both of us wonder: how could they do that? How could they jump from one guy to another and not feel exhausted at all the emotional trauma? How could they even attract so many guys when you can’t seem to attract some? You know what’s strange, though? As different as we are to Remy with regards to how you date (or not date), we’re pretty much the same with how you handle your heart. True, Remy has much more experience than us, but we both handle our hearts in the same way: closely guarded, and walls up, and no one could get in close enough to really hurt us. Not that we have been really hurt before (of course I’m not sure about when you read this, but as of this writing, we’re both single since birth and there’s still no one on the horizon — but only God knows what’s in store for the future), but we’ve definitely seen enough people get hurt so much that we don’t want to experience that, ever. But remember your brother’s wedding? Remember the feeling you had as you watched your brother tear up and how your sister-in-law looked so happy and beautiful? Remember all the love in the air as everyone celebrated their blessed union? I know you know in your heart that you wanted the same thing. I know that despite all the fear of getting hurt, despite everything that you’ve seen, heard and read, that you still want to experience the kind of love that would make you see the reason for all those love songs. Suffice to say, I liked this book more the second time around. Perhaps it’s because I understood it a little bit better, and related to it more despite my differences with Remy. Dessen is very good with writing stories that resonate well with the target audience, and as always, I like her strong characters, especially the minor ones who still manage to leave a big mark in the story. I bet Dessen can make even the smallest character who sells affordable car insurance have an leaven a mark in the story. This made me teary-eyed. Three of my closest friends just got married over the weekend (two to each other and one to someone else, in case the math confused you haha) but I guess I’m still hung-over on that happily-ever-after vibe.